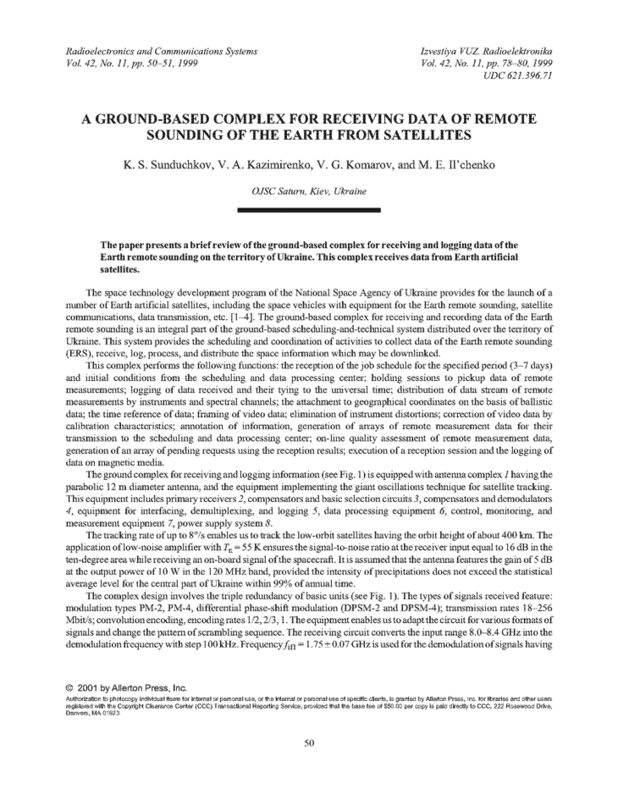 The paper presents a brief review of the ground-based complex for receiving and logging data of the Earth remote sounding on the territory of Ukraine. This complex receives data from Earth artificial satellites. Chmil’, V.; Sunduchkov, K.; Nazarenko, L.; Komiak, V.; Stefanishin, Ya. “The border multichannel radiometric complex for the remote sounding of the Earth from space, RMC "KYI"," Proc. of 5th Int. Symp. on Recent Advances in Microwave Technology, Vol. 2, Kiev, Ukraine, 1995. Bobrov, I.; Bobrov, S.; Senchenko, V.; Sunduchkov, K.; Chmil’, V. “The multichannel scanning aerial system of the radiometric microwave complex for space apparatus,” Proc. of 5th Int. Symp. on Recent Advances in Microwave Technology, Vol. 2, Kiev, Ukraine, 1995. Komarov, V.; Lipatov, A.; Saveliev, A.; Sunduchkov, K. “The modern technologies of satellite communication systems,” Proc. of 5th Int. Symp. on Recent Advances in Microwave Technology, Vol. 2, Kiev, Ukraine, 1995. Sunduchkov, K.; Kazimirenko, V.; Ilchenko, M.; Shelkovnikov, B. “Satellite communication ground station design (VSAT),” Proc. of 25th European Microwave Conf., 1995.